The summary below provides a Wrap Up and a Builders Risk market update reflecting these market changes for 2019. 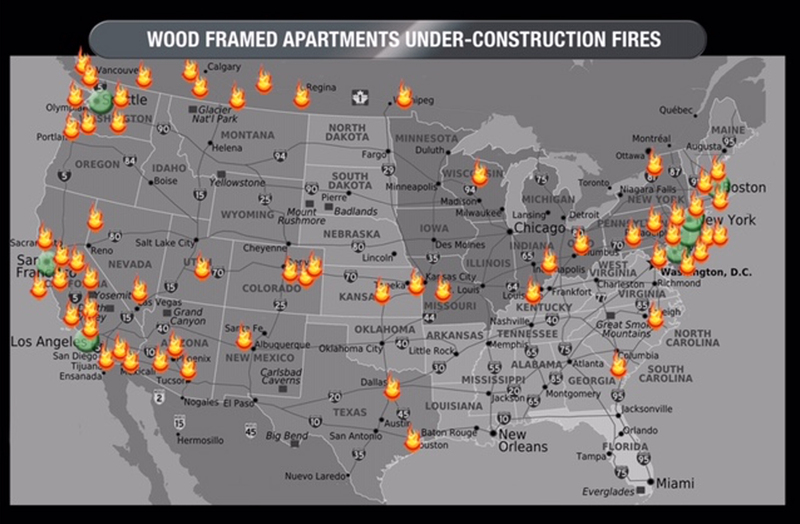 This report addresses the pricing trends on frame projects in metropolitan areas, as well as the actual arson claims that are impacting the market. As many are aware, fire claims not only impact Builders Risk insurance but they also affect areas beyond the project site such as neighboring buildings and the general public. This extension of damage will typically result in Wrap Up liability claims. As you begin budgeting for your 2019 projects and beyond, this report will help prepare you for what is to come in the insurance market as well as how to mitigate your insurance costs. Please reach out to your Woodruff Sawyer contact for any further questions. Steve Conboy, a 45 year veteran in wood framing and lumber warned builders before the Canadian wood tariff, now he is warning them about increased risk premiums, if they do not defend all the lumber from risk of loss. National insurance brokers are now contacting M-Fire to bring this new Applied Fire Science to the Insurance Risk Management teams for PK sessions. Once the Underwriters understand this loss prevention, we could start seeing some premium reductions on all high density wood framed building, including mass timber CLT types.